• Trump Jr.'s Mystery Calls Weren't to Trump Sr.
• Cain for Federal Reserve? Trump Jr.'s Mystery Calls Weren't to Trump Sr. It is probable that high-ranking members of the Trump campaign conspired with the Russians to influence the 2016 election. It is very possible that Donald Trump himself was one of them. And the likeliest "smoking gun," one that would seemingly prove the President's complicity, was his son's phone records. Both before and after the infamous Trump Tower meeting with Natalia Veselnitskaya, Donald Trump Jr. made calls to two blocked phone numbers. Since Donald Sr. is known to use phones with blocked Caller ID, these calls looked very much like they could have been status reports. And if the then-candidate was being kept abreast of exactly what was happening, both before and after the fact, then it would be pretty ironclad evidence that he was a party to whatever took place. According to new reporting from CNN, however, the phone calls were not to Don Sr., they were to two of Don Jr.'s business associates. CNN got this information from Senate staffers who have access to Don Jr.'s phone records, which have been subpoenaed. The outlet has not yet confirmed who the associates were, nor what was discussed. When it comes to the latter question, of course, only one or two or three people actually know the answer. "[M]ultiple hard drives containing several terabytes of information consisting of, among other things, FBI case reports, search warrant applications and results (e.g., Apple iCloud accounts and email accounts), bank and financial records, and the contents of numerous physical devices (e.g., cellular phones, computers, and hard drives)." It is widely rumored that Stone has a taste for certain kinds of...digital content, shall we say, that is very data-intensive. Still, even accounting for that, "several terabytes" is a lot. By way of comparison, the entirety of Wikipedia is 5.6 TB. Earlier this week, CNN legal analyst Elie Honig observed that based solely on the known facts of the case, Stone appears to be guilty of numerous federal crimes that he has not yet been charged with, including several different flavors of conspiracy. Honig's view is that there are only two plausible explanations for why these charges have not been filed: (1) Mueller does not feel he has enough evidence, or (2) Other, currently unindicted, folks will be included in the additional charges, and Mueller is waiting until that time comes to add to Stone's list. I don't think they're going to make a deal. I see what's happening. They're all saying, "Oh, let's do this but we're not giving one dime to the wall." That's okay, but if they're not going to give money for the wall, it's not going to work. And if it's not going to work, then the politicians are really wasting a lot of time. These are not the words of a man who is going to be satisfied with some sort of "threading the needle" kind of solution, like appropriating money for drones and x-rays and calling that a "virtual wall." If his position really is "$5.7 billion in new wall money or bust," then his prediction that it won't work out is dead on, since Speaker Nancy Pelosi (D-CA) said on Thursday that, "There's not going to be any wall money in the legislation." If Trump is not going to accept whatever compromise comes out of the committee, and he's not going to drop this issue, that leaves him with two options. The first, of course, is to shut down the government again. It hardly needs to be said that doing so went badly for the President and the GOP the first time, and that it would surely go even worse for them a second time, especially since the second one would presumably be even more difficult to bring to an end than the first one was. Further, Trump would be at serious risk of a rebellion, and an embarrassing veto override. That means there is just one option remaining: Declaring a national emergency. That course of action would be consistent with the poll that Trump had campaign manager Brad Parscale conduct, in which a slight majority of respondents expressed support for the wall, but a slight majority also opposed another government shutdown. Be that as it may, a "national emergency" would allow him to be on the majority side of both questions, as he sees it. No wall would be built, at least not anytime soon, but at least he could go back to the base and claim progress without having to shut down the government again. Yesterday, we had an item about the states of the Midwest/Rust Belt, and whether the Democrats can retake the White House without winning at least one of the states there that Donald Trump won in 2016 (Wisconsin, Michigan, Pennsylvania, Iowa, Missouri, Indiana, and Ohio). The conclusion: It's doable, but the blue team would be left with virtually no margin of error. Enthusiasm for voting in 2020 is even higher than it was right before the 2018 "blue wave" election. 48.5% of voters say they will "definitely" vote for someone new in 2020, another 4.7% say they will "probably" do so, and 15% more say it "depends on who the Democratic nominee is." In hypothetical matchups, Trump trails Joe Biden by 13 points (53-40), Kamala Harris by 5 points (47-42), Bernie Sanders by 11 points (53-42), and Elizabeth Warren by 3 points (46-43). It is those last two items that should be most worrisome for the President. It is pretty clear that his support is baked in at right around 42% of the Michigander vote, while a near-majority is already committed to voting against him, and a sizable minority is available to the blue team for the taking. Further, Trump isn't just losing to "generic Democrat," he's losing to every kind of Democrat the party might nominate, from progressive minority woman to old-school party-establishment white man. Given that the President won the Wolverine State by only 10,704 votes, he's obviously in a bad position. In addition to still being the Director of OMB, Mick Mulvaney is "Acting" White House Chief of Staff. Nobody has explained exactly what that means, or how long he is supposed to be "acting," a state of affairs that is likely a byproduct of Mulvaney not really wanting the job, but Donald Trump being unable to find anyone else suitable to do it. In any event, Politico reported on Thursday that Mulvaney is already plotting his next move: He really wants to take over the Dept. of Commerce. Speaking of appointments, there are two open seats on the Federal Reserve Board of Governors and, after Nellie Liang withdrew from consideration, only one Trump nominee to fill them. In view of this, according to Bloomberg News, Donald Trump interviewed former Godfather's Pizza CEO and 2012 GOP presidential candidate Herman Cain as a possible nominee for the open seat. Trump's thinking here is plain. Outside of the occasional Ben Carson, this administration is so white it could sneak across the Alaska-Canada border en masse. Cain would add a little diversity, such as it is. Further, Cain was chair of the Federal Reserve Bank of Kansas City's board of directors for several years. So, he must be qualified for a promotion, right? Maybe not so much. The directors of the various local branches of the Fed are a glorified luncheon club that meets once a month to chat over finger sandwiches and to make recommendations that the actual bankers at the Fed largely ignore. Beyond that, Cain has had a number of accusations of sexual harassment and misconduct lodged against him. Oh, and he has no training in economics or economic policy. He's about to jump in, so we are going to get this in just under the wire. But not by much. 15 minutes after we posted this profile, Booker chucked his hat in the already crowded ring. Background: Born to parents who were among the first black executives at IBM, Booker is yet another Democratic candidate with a résumé that wouldn't be believable if he was a fictional character. In both high school (Northern Valley Regional High) and college (Stanford), he was class president, a football letterman, and a straight-A student. After earning his BA in political science and MA in sociology at Stanford, he was chosen as a Rhodes Scholar, and took a third degree (in U.S. history) at Oxford. Then it was back to the States, and a law degree from Yale. While in law school, he ran free legal clinics for the poor, and volunteered for Big Brothers Big Sisters of America. After graduation, he worked as a staff attorney for the Urban Justice Center and as program coordinator of the Newark Youth Project. None of his published biographies say that he helped little old ladies across the street, or that he rescued babies from burning buildings, but he probably did those things, too. (Note: Since posting this, we have heard from readers that he has indeed saved someone from a burning building). Political Experience: In 1998, just shy of his 30th birthday, Booker won a seat on the Newark Municipal Council. He was a lefty, even by the standards of New Jersey, and attracted a lot of attention for various dramatic gestures, like going on a 10-day hunger strike to draw attention to the city's problem with drug dealers, and then living in a tent near the drug-infested parts of town. In 2002, after two terms on the municipal council, Booker ran for mayor and lost. He took advantage of the downtime to found Newark Now, which raises money for urban renewal. In 2006, he launched a second mayoral bid, and won a landslide victory with 72% of the vote. He was reelected in 2010, and then in 2013 announced he was going to run for the U.S. Senate seat from which Democrat Frank Lautenberg was retiring (although, as it turned out, Lautenberg died before he could finish his term). Booker won that election with 59% of the vote, and is now in the latter half of his first term. Signature Issue(s): Urban renewal. All of his most notable political successes, including reducing the numbers of guns, poor people, and drugs on the street, have to do with reinventing America's cities. In fact, in 2009, while still mayor of Newark, he was offered and declined leadership of the White House Office of Urban Affairs. Booker is also famously pro-physical fitness and pro-healthy eating (he is himself a vegan), but those are not the stuff from which the center plank of a political platform is fashioned. Instructive Quote: "The drug war has been a war where the direct casualties have primarily been America's poor; America's minorities; and often, unfortunately, America's vulnerable, in terms of people with disease and addiction and mental health." 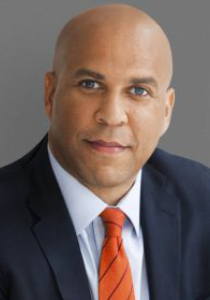 Completely Trivial Fact: If elected, Booker would be the fourth president to have lettered in football in college, following Ronald Reagan, Gerald Ford, and Dwight D. Eisenhower. If we add other sports to the list, then the presidential lettermen's club also includes William Howard Taft (wrestling) and George H.W. Bush (baseball). JFK and Richard Nixon also played college football, but neither was good enough to see the field, even at not-exactly-powerhouses Harvard and Whittier College. Recent News: Booker learned this week that although it was against the rules for him to make public a bunch of e-mails related to Brett Kavanaugh back in September, he's not going to be sanctioned. Three Biggest Pros: (1) If there is any candidate in this year's field who can be Obama v2.0, it is Booker; (2) In 2016, Bernie Sanders had trouble with minority voters, and Hillary Clinton had trouble with progressive voters—Booker should appeal to both groups; and (3) If there's one type of candidate that Trump cannot use his bullying/attack politics against, it's tough guys from New Jersey. Recall that Marco Rubio had small hands, Ted Cruz's dad helped kill Kennedy, and Jeb Bush was low-energy, but nary a word was said about the gives-as-good-as-he-gets Chris Christie. Booker, by all evidences, is even tougher than Christie is. Three Biggest Cons: (1) The blue team isn't going to be making any inroads with rural voters if they choose the former mayor of Newark as their candidate; (2) A candidate's wife is generally an invaluable surrogate during campaign season, but Booker is not (and never has been) married; and (3) As it currently stands, Booker will simultaneously run for the White House and for reelection to the Senate (which is legal thanks to a recent change to state law his fellow New Jersey Democrats rammed through); that could be a turnoff for some voters. Is He Actually Running? : Yes. He's started calling colleagues on the Hill, and asking them for their support. Although he announced today, Booker laments that he allowed Kamala Harris to lay claim to MLK, Jr. week for her announcement. Betting Odds: He's getting anywhere from 25-to-1 to 16-to-1, implying a 4-6% chance of getting the nod. The Bottom Line: The betting odds are probably underselling Booker, as he is one of the Democrats' strongest candidates. In particular, he will benefit from the fact that there aren't any candidates that are highly similar to him. In other words, there's no Elizabeth Warren to his Kirsten Gillibrand, or Jon Tester to his Steve Bullock.